Somehow I didn't get an "official" photo of you this month! I'm still all sorts of sad about that! Luckily I did get plenty of actual photos of you this month so it's not world ending. You are a whole half year. That is crazy talk. It flew by so incredibly fast. 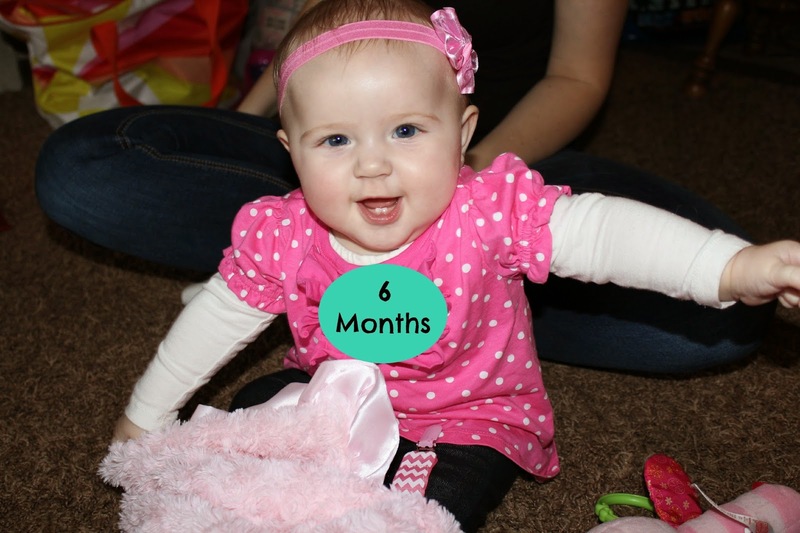 At your six month appointment you weighed fifteen pounds eight ounces in your jammies and diaper (47%) and were twenty-seven inches tall (90%). Again tall and lean! You're wearing a size three diaper and six month clothes mostly but have just started fitting into nine months things too. You still sleep in Mommy and Daddy's bed. And haven't slept through the night yet. Apparently we don't make the kind of baby's that sleep all night. It's a good thing you're cute! Ha! We're working on trying some new foods. You've tried sweet potatoes (loved! ), squash (seemed to enjoy), banana (not so much), and pears (nope). You also got to try some apple juice in an effort to get you back on "track". It worked thank goodness. We did take a little bit of a food break this month after your system got all out of whack from all of it and cut back to just nursing to let your tummy settle. We celebrated our first Christmas! Much to all of our surprise you had a lot of fun with it. You particularly liked all the bows on the presents. And were not thrilled when I kept taking them away from you while you were trying to eat them. What is that all about? You got to see your first movie in the theater! I seriously cannot believe how awesome you were. You watched the beginning, slept through the middle, and then watched the end. We were so impressed! Grandpa and Grandma watched you for our anniversary and you really made them work for it. You are just such a Mommy and Daddy's girl and anyone else you'll deal with but only for so long before you want to know where one of us are. Cutest thing ever this month is that you play peek-a-boo! You pull your blankie up over your head and then back down and laugh when we say peek-a-boooooo! It is so cute Obviously it means you are so smart too! Baby genius over here can play peek-a-boo like a pro at six months old. You like to play patty cake. And sing Head, Shoulders, Knees, and Toes. Your favorite book is Touch and See Baby Animals. Your current favorite toys are your singing doggy and your little baby laptop. Not that you don't also love my laptop. Just that you aren't supposed to play with that one no matter how much you want to! Being a baby isn't really working your you these days and you've been trying to crawl and you're so close. You also want to stand! And make your own decisions. Something you make obvious by getting mad and screaming at us. Or laughing when we tell you no. Good times. As you get more and more aware of your surroundings you've also been taking a little longer to warm up to new places. It takes you about a half an hour. Until then you stick right to me and don't want to be put down. I can see the relationship between you and Preston growing with each month and how much the two of your love being around each other! Makes my Mama heart so happy to see how much you love love love him! And how much the feeling is mutual for him! You've got attitude. No surprise there. But still. When you get mad at us you'll scream. You've been laughing when we tell you no. You're going to put us through it aren't you.